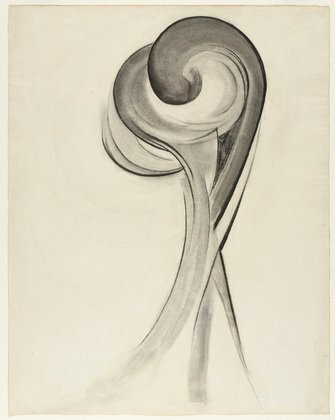 Georgia O’Keefe’s annoyance at the high-handed attitude of Alfred Stieglitz in exhibiting ten of her charcoal abstract works in his gallery alongside other artists’ paintings, without her permission, in May 1916 soon cooled off and maybe Stieglitz decided to make amends by offering Georgia a solo exhibition at his gallery. She agreed and in April 1917 she had her first solo show. It was the final exhibition at Stieglitz’s 291 gallery as shortly afterwards it closed. Georgia O’Keefe and Alfred Stieglitz although living thousands of miles apart corresponded regularly and once again fate played a part in the course of her life. In this case fate came in the form of an influenza epidemic which, in 1918, was sweeping across America and which killed around 750,000 people. Georgia was struck down by it in the February and her recovery was slow and prolonged and she eventually had to give up her teaching post. Alfred Stieglitz was very concerned about Georgia’s health and sent his friend and fellow photographer Paul Strand to Texas to try and persuade Georgia to leave Texas and come to New York where he would support her health-wise and financially. 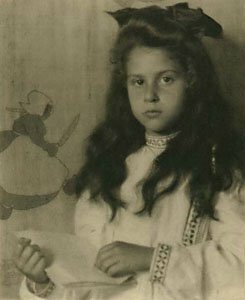 She acquiesced and although still very ill arrived in New York in June 1918 and went to live in a studio which belonged to Stieglitz’s niece. Stieglitz slowly nursed Georgia back to health and during this time the couple fell in love. When she was well enough she went to live with Stieglitz at his Lake George home in upstate New York. It was more than just a house and home; it was a former farm covering thirty-six-acres. It was situated along the western shore, in the southern section of the thirty-mile-long glacial lake, which was popularly known as “the Queen of American lakes”. It was here that she convalesced amongst the peace and tranquillity of the flower-filled meadows and forest areas around his family home. It was here that she would return from the bustling New York city every summer for the next sixteen years. She enjoyed to take long walks through the wooded hillsides, often took on strenuous hikes up Prospect Mountain so as to gain sight of spectacular views of the lake below, a lake on which she also enjoyed to row upon. Georgia had first been introduced to the Lake George area back in 1907, when she was a student at the Art Students League and had received a scholarship to paint in the region. O’Keefe and Stieglitz would spend the winters in their apartment in New York and from April to September or October would live in the large house on the banks of Lake George. Georgia produced a number of works featuring her new summer surroundings and even one, in 1922, of this new” bolt hole”. It was entitled My Shanty, Lake George. 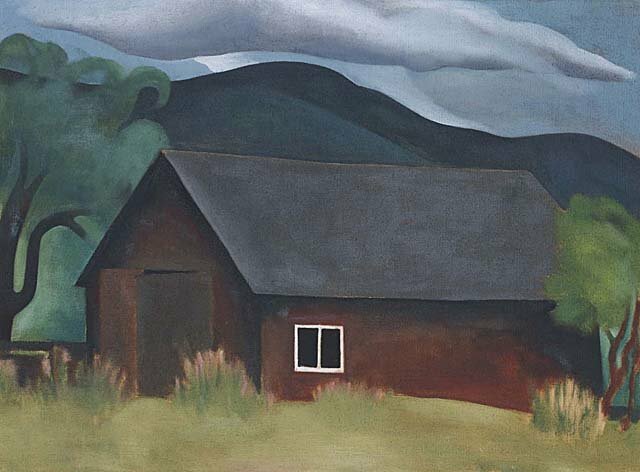 It is a simple yet atmospheric depiction of the isolated old farm building which became her summer studio, away from the distractions of the big lake house. In a way it is a reflection of O’Keefe’s desire for solitude. There is a noticeable contrast between the man-made object and nature. The flat geometric depiction of the building is in complete contrast to the curves of the trees and the hills. There is also a great contrast in colour. The sombre dark colours of the building itself is in contrast with the softer pinks and oranges used for the wildflowers and the greens of the grass in the foreground. The darkness of the shanty is however vividly lightened by the intense white window frame and mullion and they serve as the paintings focal point. In the background we can see blue-black sweep of the hills, above which are dark storm clouds. 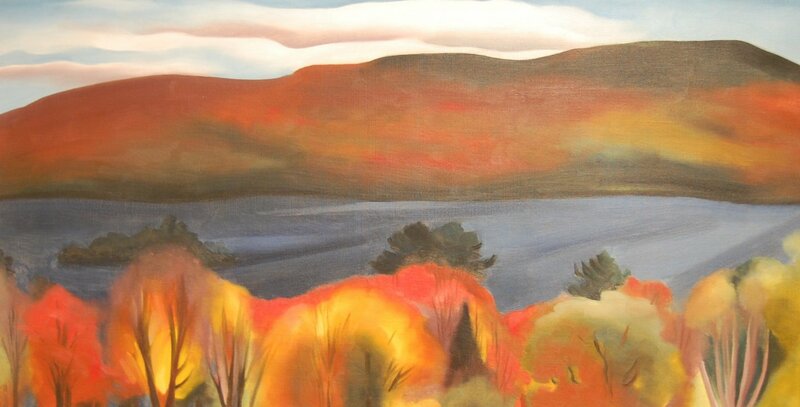 Georgia O’Keefe painted many pictures featuring Lake George. As far as the composition is concerned they were often very similar. The top third of the painting was dedicated to the mountains. The middle ground of the work was a depiction of the lake and in the foreground were the trees. 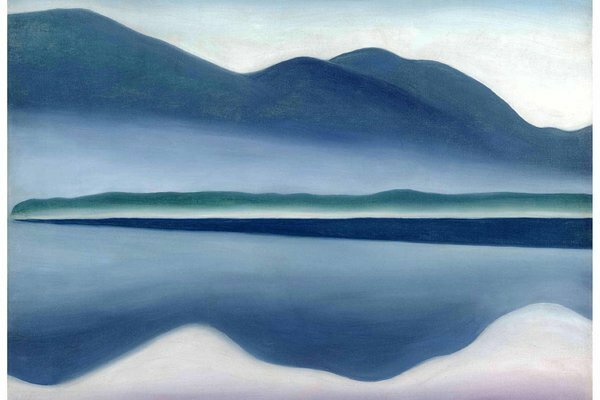 However in the case of her 1922 painting, Lake George (formerly Reflection Seascape) the well tried composition changed and the shoreline of the lake disappears and the work almost becomes an abstract one. The colours and tonal quality of this work are so beautiful that if trees had been added to the foreground they would have been a distraction and detracted from the overall depiction. As far as Emmy was concerned, it was a case of unrequited love. She loved him. He didn’t love her. Emmy had inherited money from her late father who had run a brewing empire. Could it be that Emmy’s wealth smoothed over Stieglitz unhappiness with the marriage, especially as around this time, his own father had lost a large amount of money on the Stock Market? The marriage was doomed to fail despite the couple having a daughter Kitty in 1898. They had nothing in common. They had no shared interests. Stieglitz soon tired of his wife and they spent long periods of time apart as he carried on with his photographic career, travelling all over Europe. Richard Whelan in his 1995 biography of the photographer, Alfred Stieglitz: A Biography, wrote that Stieglitz resented her bitterly for not becoming his twin. 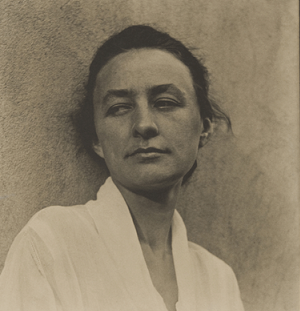 Despite his unhappiness at being trapped in a loveless marriage and his open relationship with O’Keefe, Stieglitz could not extricate himself from his marriage to Emmy until September 1924, six years after he had originally filed for divorce. Alfred and Georgia married in late December 1924. 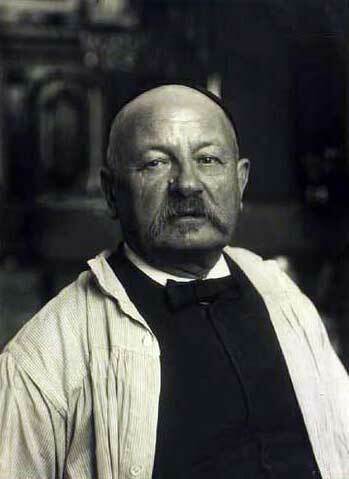 Georgia had been somewhat reluctant to enter into marriage as she saw no point in formalising their relationship as she and Stieglitz had lived together for six years and survived the scandal attached to his extra-marital liaison. The marriage took place at the home of their friend and fellow artist, John Marin. There was little or no pomp and ceremony to the occasion. Nobody was invited to a reception or help celebrate the marriage. In fact there was no honeymoon following the event. 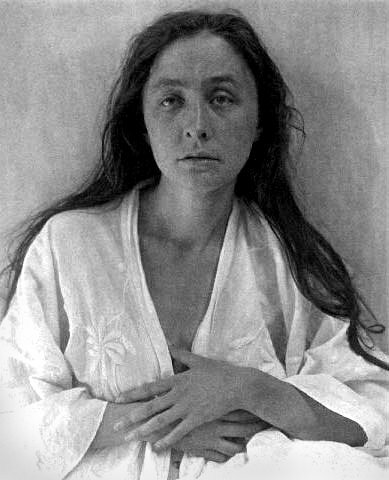 In her 1989 biography of the artist, Georgia O’Keefe, A Life, Roxanna Robinson, quotes O’Keefe as saying that she and Stieglitz married in order to help soothe the troubles of Stieglitz’s daughter Katherine, who at that time was being treated in a sanatorium for depression and hallucinations. The following year, 1925, Georgia and Stieglitz moved their New York home to the Shelton Hotel in New York, taking an apartment suite on the 28th floor of the new building and it was here and the summer home at Lake George that the couple would spend the next 12 years. One can just imagine how their dual aspect apartment in the hotel, with vistas to the north and south, afforded them spectacular panoramic views of the vibrant city. Georgia began to paint pictures of the city skyscrapers, including the Shelton Hotel itself, the Radiator Building and the Ritz Tower all from a low-level viewpoint. 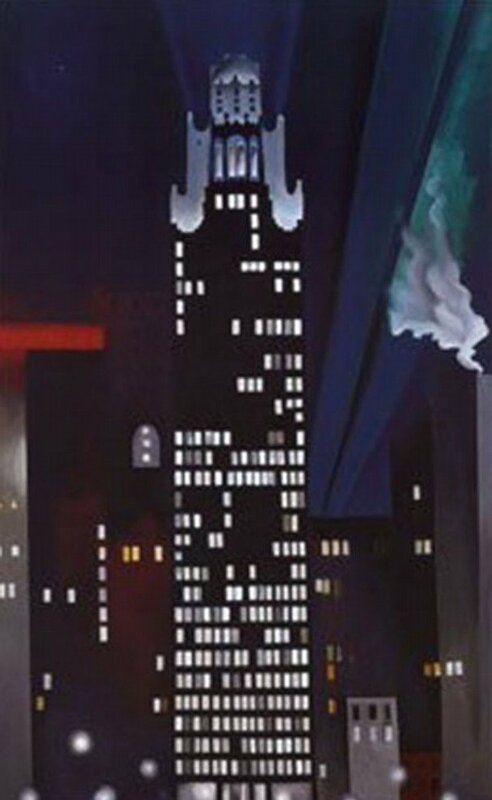 Her depiction of the Radiator Building in 1927, entitled Radiator Building – Night, New York is a haunting study of the magnificent building on West 40th Street, in midtown Manhattan which was completed three years earlier in 1924. The painting depicts a night scene of the building in which the illuminated windows shimmer against the dark of the building and the darkness of the night. To the right of the building we see steam and smoke slowly rising upwards from some ventilation system whilst in the left hand background searchlights scan the night sky and a red neon sign glows in the left background. 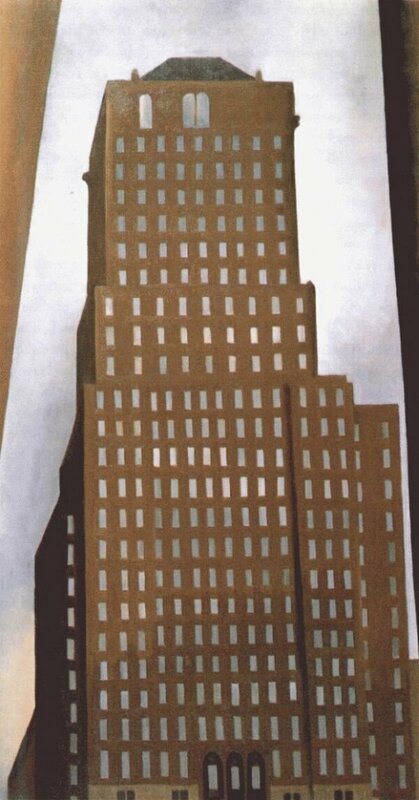 This type of painting by Georgia O’Keefe led her to be connected with an informal group of American artists who were inspired by the size and scale of modern American structures, such as bridges and skyscrapers. They were known as Precisionists or Immaculates and it was during the 1920’s and into the early 1930’s that Precisionism blossomed. Sometimes it was referred to as Cubist-Realism. 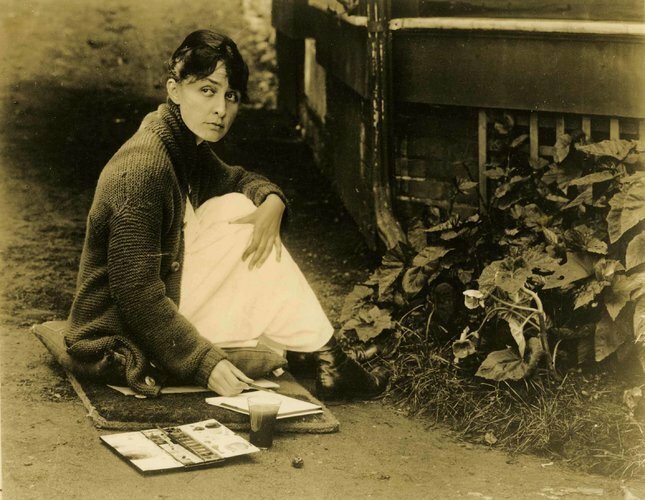 My next blog, the third part of Georgia O’Keefe’s life story, will focus on her large flower paintings and will explore her relationship with Stieglitz and her decision to live apart from him and head for the desert state of New Mexico which was to influence her later art. If I was to ask you who was the most quintessential American artist, I wonder whom you would choose. Would you go for one of the nineteenth century Hudson River School artists such as Frederic Church, Asher Durand and Thomas Cole or would you select one of the pioneering and tenacious American female painters who fought hard to gain a foothold in the male dominated world of art, such as Mary Cassatt and Elizabeth Jane Gardner. Perhaps you would decide on one of the great twentieth century painters such as Andrew Wyeth or Edward Hopper or the folk artist Grandma Moses. Then of course, let us not forget, there is John Singer Sargent and James McNeill Whistler and naturally there are the modern greats of American art such as Rofko, Warhol, Pollock and de Kooning. I suppose it is impossible to single out one from the list of artists who paint in so many different genres. 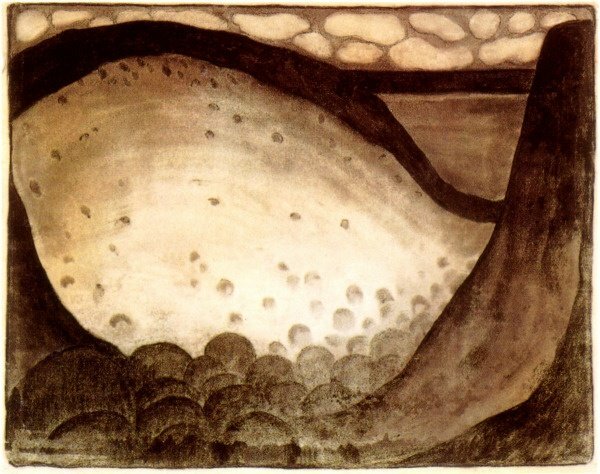 However, for me, the painter who symbolises America is Georgia O’Keefe and in my next blogs I will look at her life and feature some of her best-loved paintings. 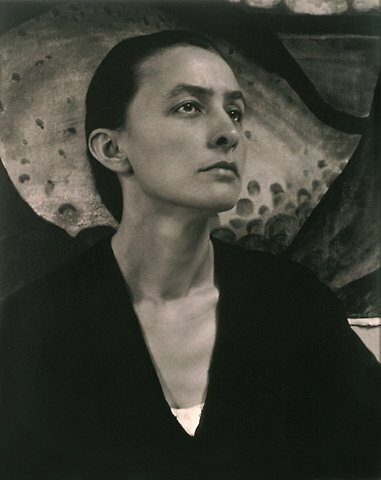 Georgia Totto O’Keeffe was born on November 15, 1887, the second of seven children. She was the eldest of five girls and had a younger and elder brother. Her father, who was of Irish descent, was Francis Calyxtus O’Keefe, who ran a successful farmstead on the outskirts of the village of Sun Prairie, Wisconsin, along with his wife Ida Ten O’Keefe (née Totto), whose maternal grandfather was a Hungarian count. 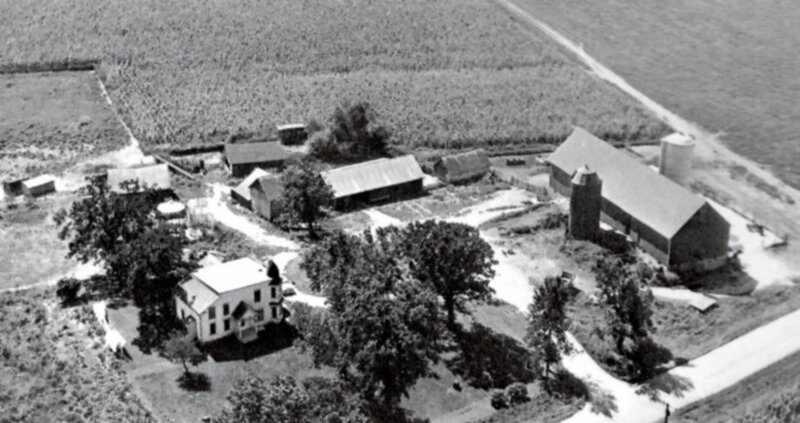 The farm was spread over 1700 acres of land on which they raised cattle, horses and grew crops. 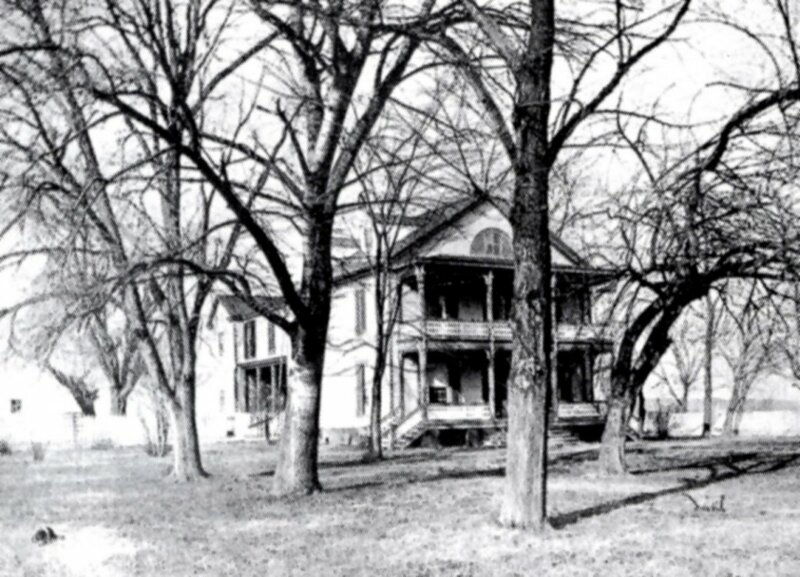 When Georgia was five years of age she attended the small one-roomed South Prairie Town Hall school. She progressed well and she and her siblings were constantly being pushed to learn by their mother, who would read stories to her children and play the piano for them. In fact Georgia went on to play both piano and violin. In 1905, Georgia, now seventeen years of age, graduated from high school and enrolled at the Art Institute of Chicago. 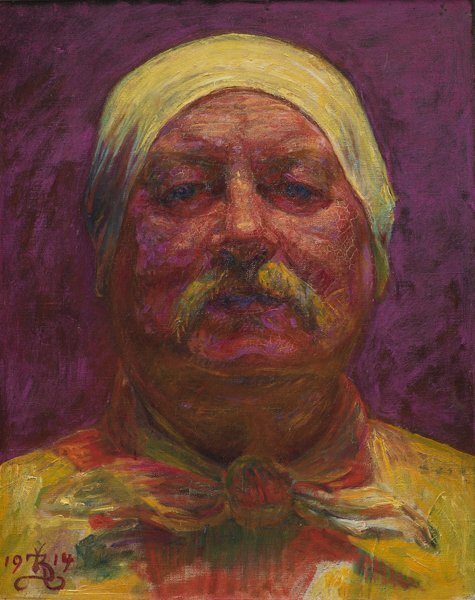 It was here that she honed her skills as an artist and studied composition, anatomy and life drawing. Her anatomical drawing class tutor was John Vanderpoel, the Dutch-American artist and teacher, who was best known as an instructor of figure drawing and whose 1907 book, The Human Figure, became a standard art school resource. 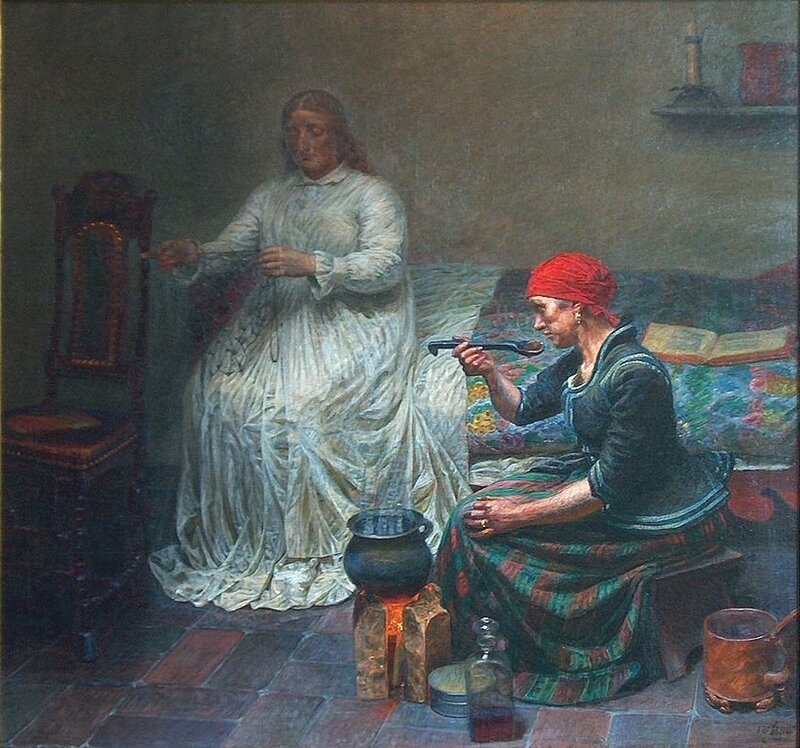 Georgia O’Keefe excelled at the Academy and all was going well until the summer of the following year when she went home and contracted typhoid and was so ill that she was unable to rejoin the Academy. She had to remain at home to recuperate for more than twelve months. When she finally got her health back in 1907, she decided to resume her art career but instead of returning to Chicago she enrolled at the Arts Student League of New York which was one of the top art colleges of the time. One of her tutors was William Merritt Chase, who was one of the foremost art teachers of his generation. 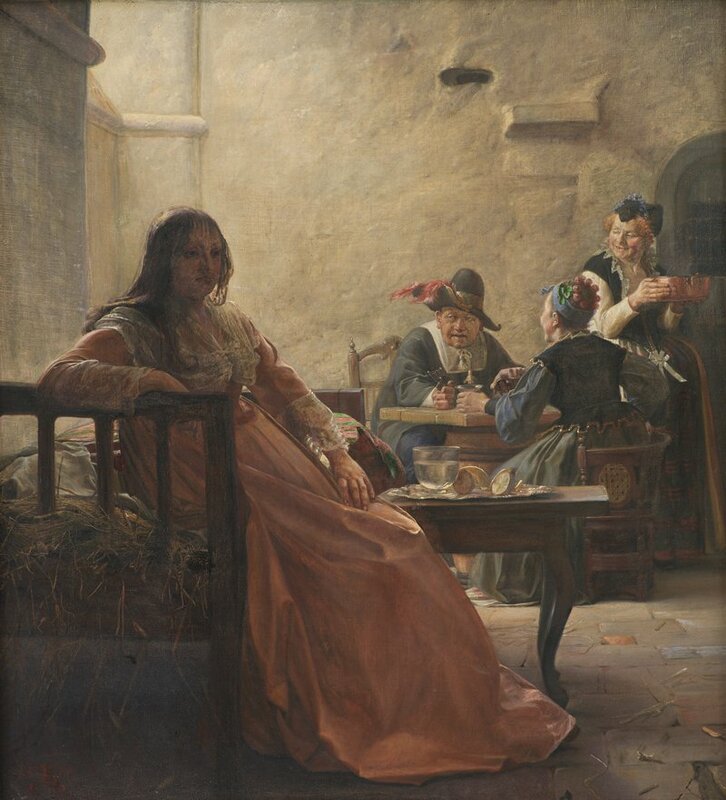 At this institution aspiring young artists were trained in the European tradition, namely, learning to paint portraits and still-lifes. 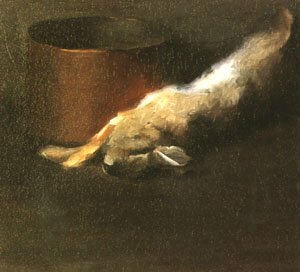 Once again her artistic talent shone through and the following year she won the League’s William Merritt Chase still-life prize for her oil painting Untitled (Dead Rabbit with Copper Pot). 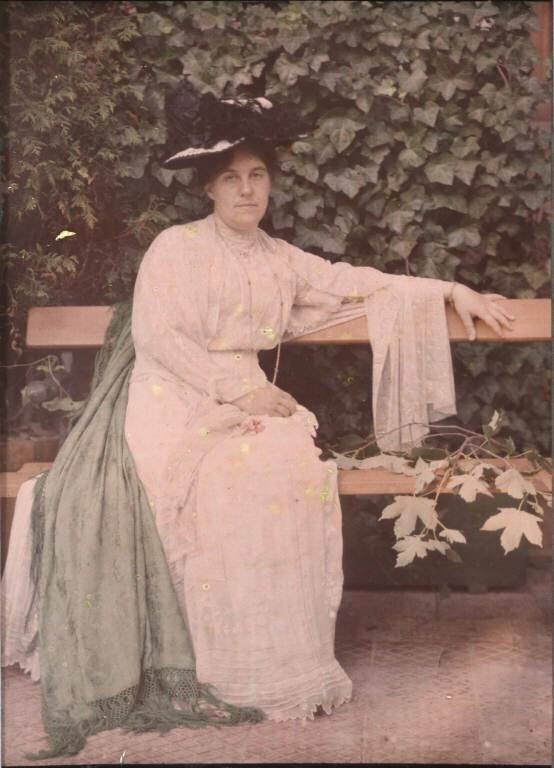 Her prize was a scholarship to attend the League’s outdoor summer school at Lake George, in upstate New York, east of the Adirondack Mountains. In 1908 things changed for Georgia. The Arts Student League of New York wanted to keep to the European tradition of art tuition, copying in the style of the Old Masters. It was a conservative formula and one will never know whether it was this rigid mimetic way of teaching art that disillusioned Georgia, but at the end of her year’s tuition in the autumn of 1908, she decided that she no longer wanted to become a professional artist. Another reason for giving up on her art studies was that her father’s business had collapsed and the family was in need of an extra income and so Georgia gave up her studies and embarked on a career as a commercial artist in Chicago where she spent her time designing adverts and company logos. She did not paint another picture for four years. You can sense her joy. You can sense her feeling of casting off the shackles of rigid academic teaching. You can sense the elation in the way she saw her future. 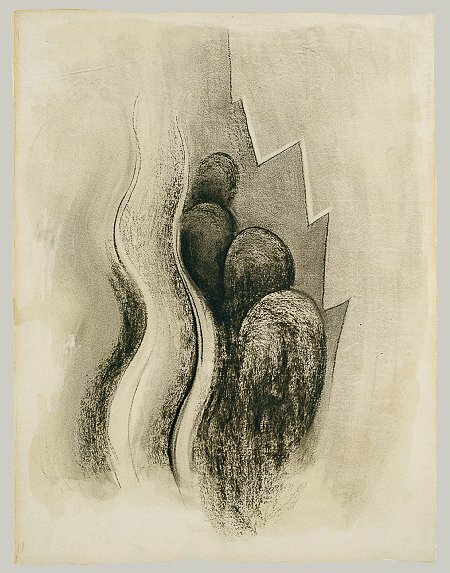 In September 1915, she accepted a teaching post at Columbia College, South Carolina and it is around this time she begins to experiment with her art, producing a series of amazing cutting-edge charcoal abstract drawings. 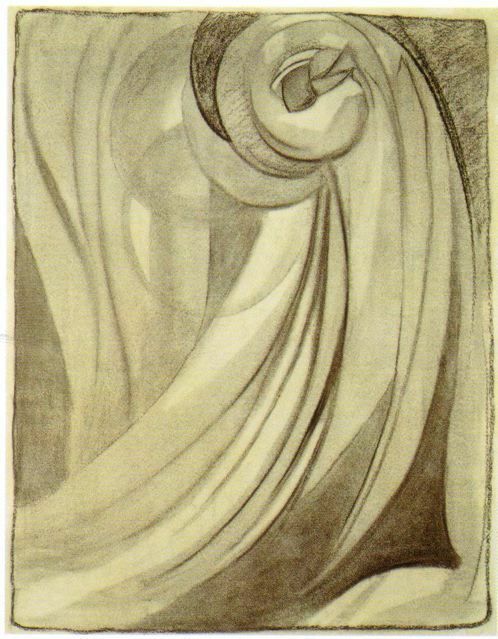 One such drawing was entitled Drawing XIII which was completed in 1915. In this work we see that the image is sub-divided into three parallel sections. The left hand section has wavy vertical lines which reminds one of a meandering river although some say it is more like a vertical flickering flame reaching upwards. The central part of the work consists of four rounded bulbs which if we continue with our thoughts of nature could then be construed as round top hills. An alternative to this premise is that they are four densely foliated trees. The right hand section comprises of a series of jagged lines which could be a representation of mountains and so in a way this drawing may be a bird’s eye view of a range of mountains and a flowing river with trees separating the two. Another of her charcoal works was entitled Early No. 2 which she also completed in 1915. 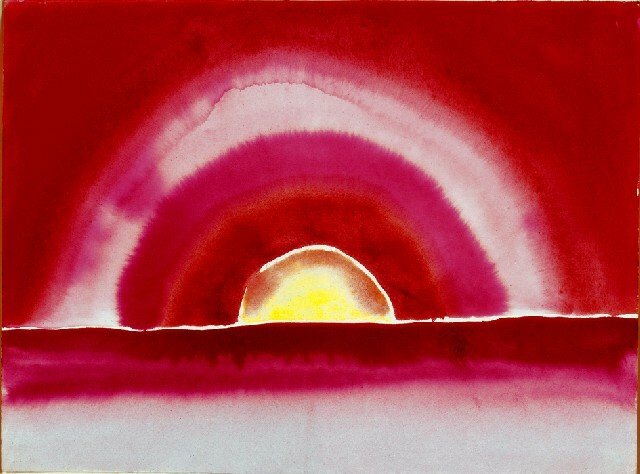 O’Keefe has followed the advice of Arthur Dow and focused on the lines, shapes and tonal values which she, like Dow, believed were the fundamentals of the picture. Her reasoning behind these early drawings being in black and white and devoid of colour was her belief that colour would distract viewers from what she had hoped to create. It was all about curves and geometrical shapes and the clever balance between areas of the work which were light and shaded. Unbeknown to O’Keefe, Stieglitz exhibited her drawings at his gallery alongside works by other artists. When O’Keefe found out about this, she was not best pleased but later forgave him. 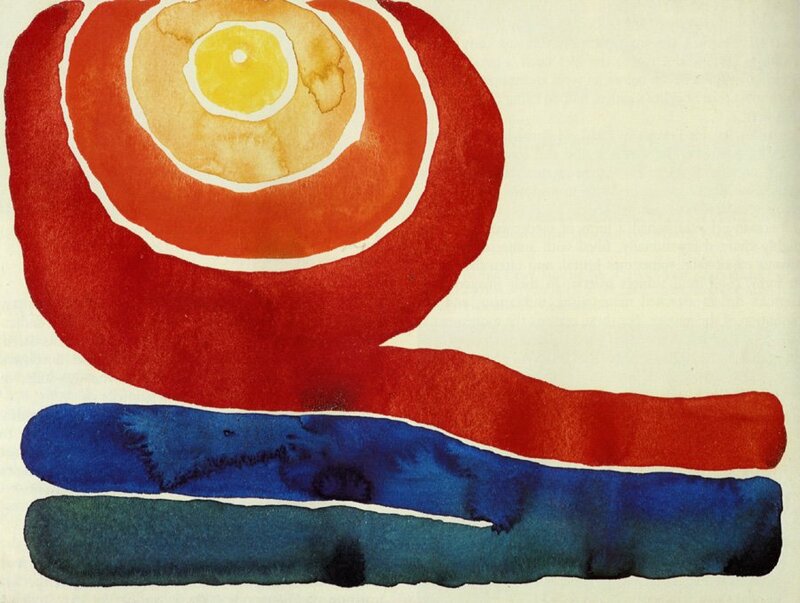 This initial collaboration between artist and gallery owner was to be a turning point in Georgia O’Keefe’s artistic life. In art, the hackneyed phrase “size matters” is not relevant as some of the most beautiful works of art are quite small. In my first look at the Veronese exhibition at London’s National Gallery I focused on some of the artist’s monumental works which were on show. In today’s blog I want to look at some of the smaller paintings which were on display at the exhibition. 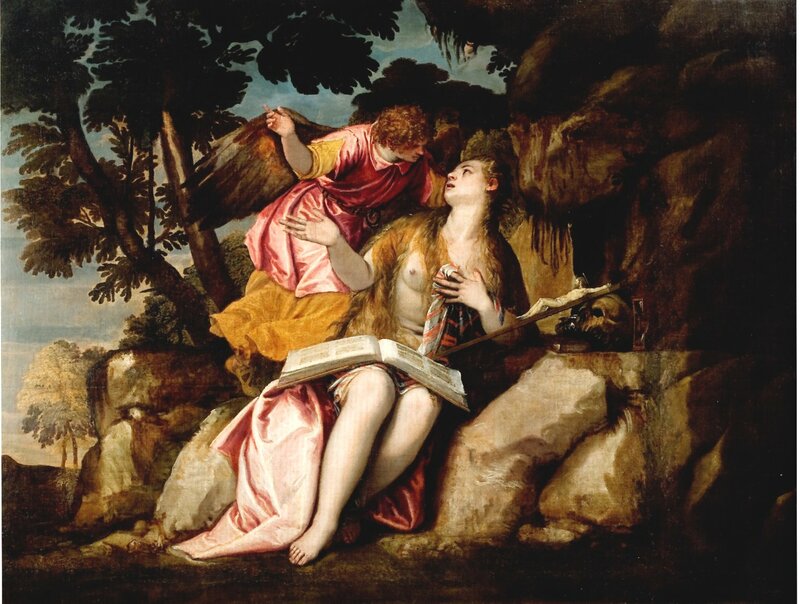 The first painting I want to feature is Veronese’s oil on canvas work entitled Mary Magdalene in the Wilderness which he completed around 1585 and is on loan to the exhibition from a private collection in Genoa. The scene is a cave, bathed in moonlight, which is home to Mary Magdalene. Legend had it that after the death of Christ, his resurrection and finally his ascension into heaven, she, along with her brothers Lazarus and Maximin, fled the Holy Land in a rudder-less boat and one without a sail and landed at Saintes-Maries-de-la-Mer in the Camargue near the city of Arles. From there she went to Marseille before living for thirty years in a cave in the Saint Maximin-la-Sainte-Baume Mountains. According to legend, during her self-imposed exile, she went on a strict period of fasting and that but for occasional visits by the angels, and the comfort bestowed by celestial visions, she might have died. The only food she received was the Holy Eucharist which was given to her by angels. In the painting, we see Mary Magdalene leaning back against a shelf as she converses with the angel who has descended to offer her a modicum of comfort. 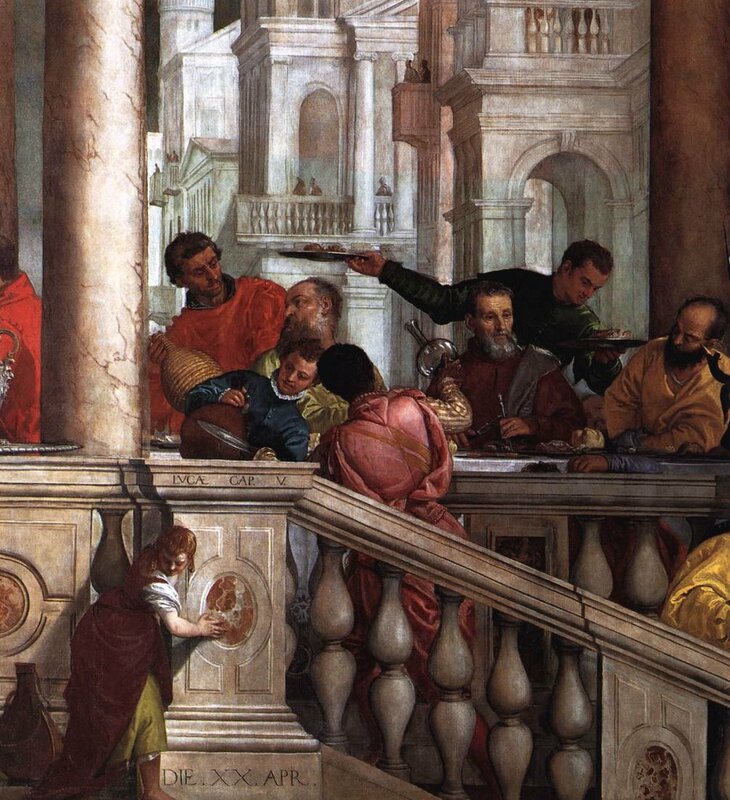 Veronese has retained her youth and beauty despite what would have been her real age. She is depicted as being semi-naked although she attempts to cover up her nakedness with her hair and diaphanous clothing. Her legs are bare and her breast is exposed and this portrayal of her is probably meant to remind us of her previous immoral life. Look at the shelf behind her. On it we can just make out a number of items. There is an alabaster jar which is the traditional attribute of Mary Magdalene, reminding us of the jar of very expensive aromatic oil, pure nard, with which she anointed the feet of Christ. Also on the ledge there is a skull and an hour glass, both Vanitas symbols alluding to the passage of time and the inevitability of death. Propped up against the skull is a crucifix reminding us of the death of Christ which Mary Magdalene witnessed first-hand. It is thought that the painting, which was purchased around 1736 by the Doria family, was enlarged during the eighteenth century so that it fitted snugly within decorated plasterwork of one of the rooms of their Strada Nuovo palace in Genoa. The painting depicts the moment when the Pharaoh’s daughter, Bithiah, and her ladies-in-waiting have plucked the basket, made of bulrushes and pitch, from the reeds on the edge of the Nile River. The basket was the one in which the baby, Moses had been placed by his Hebrew mother, Jochebed, in order to save him from the slaughter of all male Hebrew children ordered by the Egyptian Pharaoh. 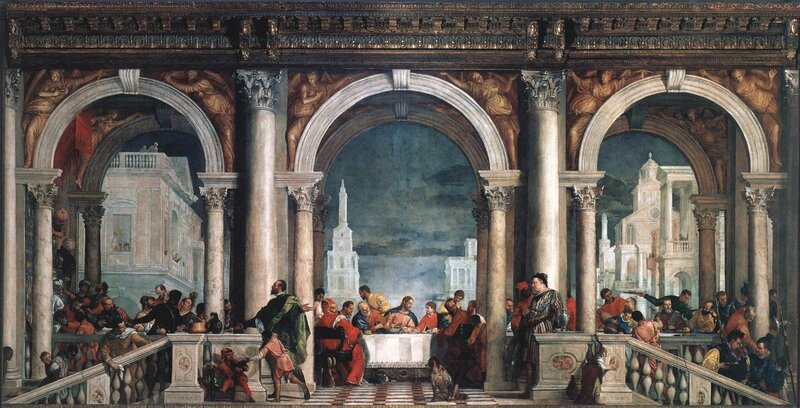 Although this obviously a religious work it has secular connotations and this secularising of the work made it one of Veronese’s most popular subjects. He completed many versions of this depiction, some small like this one, others much larger. This painting has combined the pomp and ceremony often seen in secular works with a story from the bible. The Pharoah’s daughter and her royal attendants are lavishly dressed in sumptuous gowns. Bithiah, as the Pharoah’s daughter, is the most lavishly dressed in stunning orange and white damask gown. To her left is one of her attendants, dressed in blue, holding a blanket ready to wrap up the baby who is being cradled by another attendant who can be seen crouching down with Moses in her arms. The background at the left of painting depicts a river flowing through a large town and is crossed by a bridge. 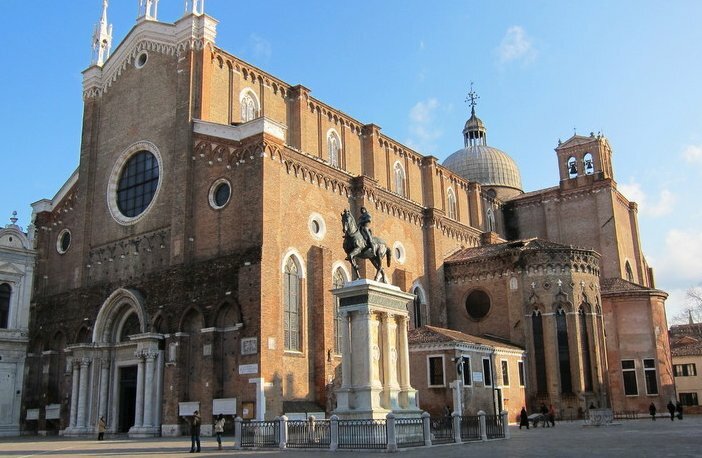 This could well be based on city of Verona, which has many bridges straddling the fast-flowing Adige River. In the left foreground we see one of her black servants holding the basket which had once carried the baby down river. 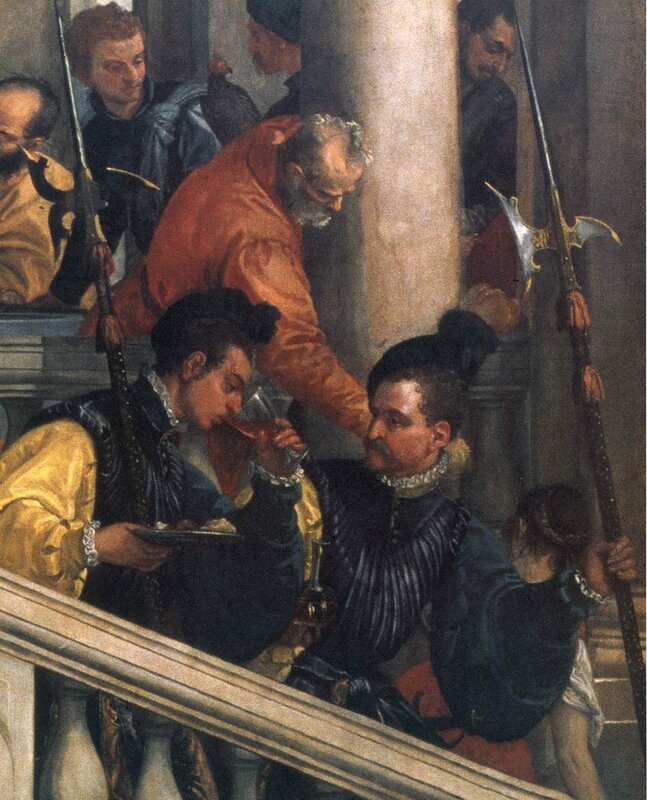 To the right of the painting Veronese has included a dwarf in the company of the women. 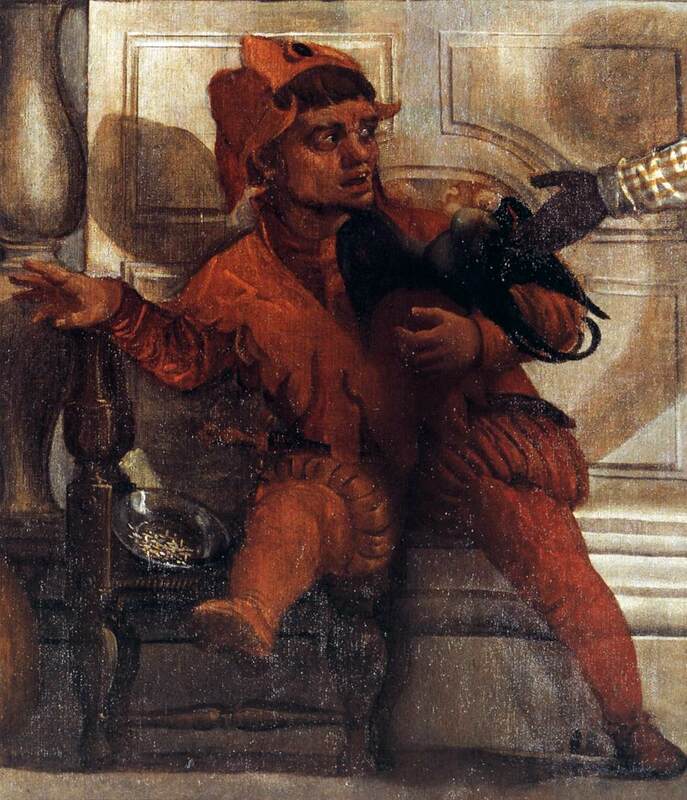 Dwarves were often present at 16th century European courts and depicted in paintings of the time. 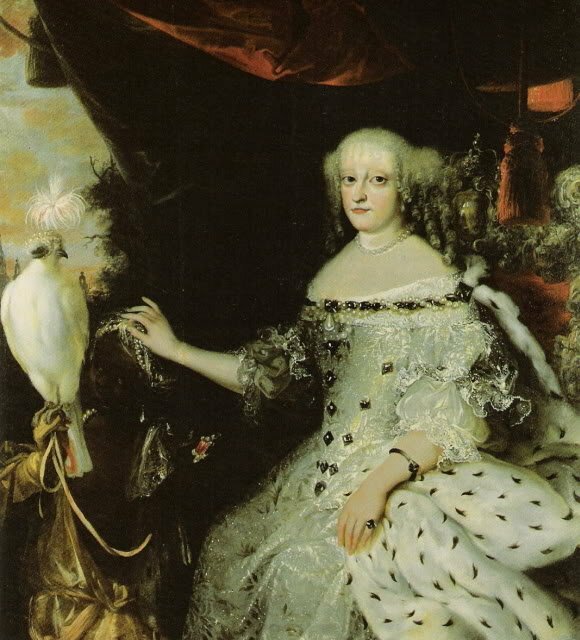 It is thought that this version of the painting was commissioned by Marquis and Marchioness della Torre of Veneto. Its emergence in Spain dates to the 1666 inventory of the Alcázar of Madrid. My third offering is a portrait which Veronese completed around 1560. It is entitled Portrait of a Lady, ‘La Bella Nani’ and this work is considered to be Veronese’s greatest stand-alone female portrait. Venetian portraiture of Venetian courtesans was very popular at this time with works by the Italian painter of the Venetian school, Palma Vechio, the Italian painter of the Venetian Renaissance, Paris Bordone and Titian. This portrait by Veronese was often likened to Titian’s 1536 work entitled La Bella. 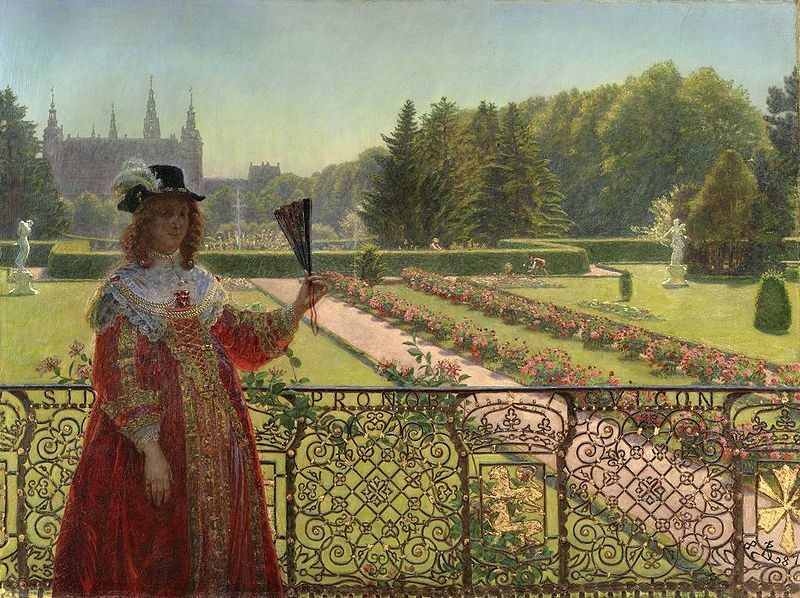 In both these paintings the female sitter exudes a sense of opulence by the sumptuous and expensive clothes they wear. 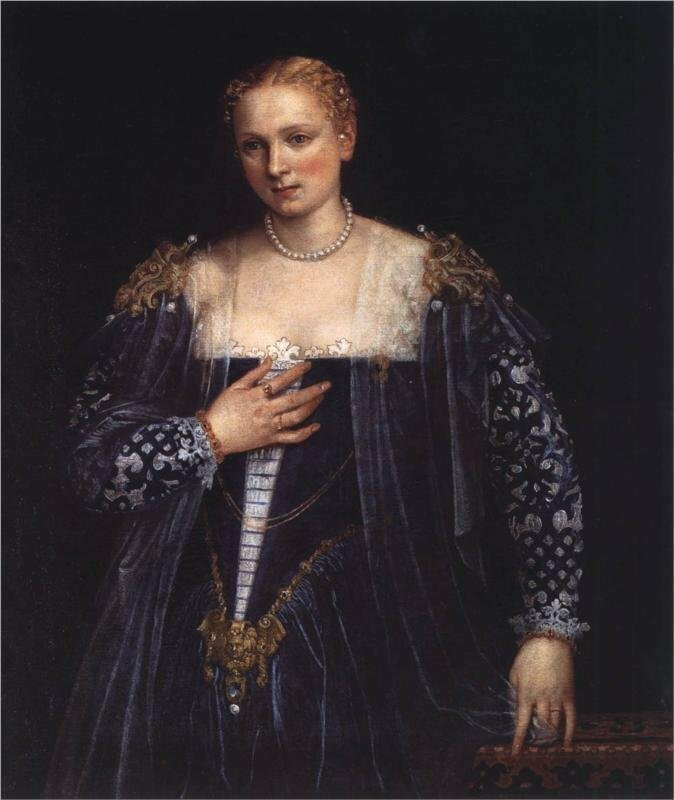 Veronese’s woman is standing with her left hand spreading her gossamer veil whilst her right hand is at her breast. Her hair is set tightly, and bejewelled with pearls. She wears a velvet dress which is deep ultramarine in colour and has gold epaulets; The colour of the dress was originally blue although over time sunlight has caused the painting to darken and the beautiful ultramarine dress seems black with just a hint of blue woven in. 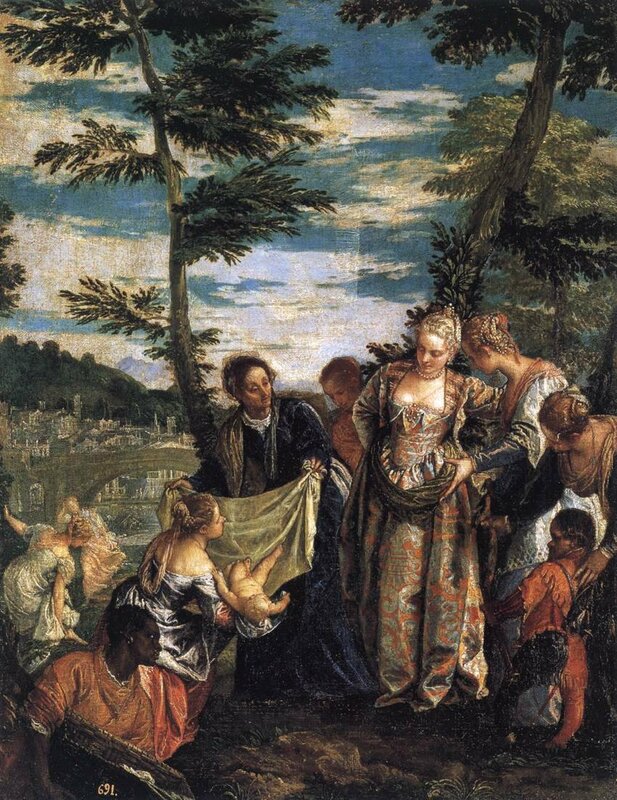 Veronese’s clever and complex layer of glazes makes the expensive material of the dress shimmer in the light. Her make-up is perfect with rouge on her cheeks she wears an assortment of jewellery, including a large gold piece hanging at her waist. Her wrists are adorned with gold bracelets, on her fingers there are gold rings and around her neck we see a string of pearls. The combination of the jewellery and clothes transforms her into what we would now term a fashion idol. 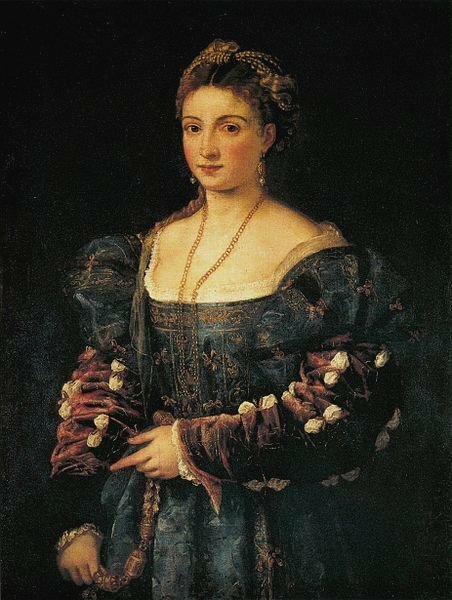 As was the case with Titian’s female, we do not know who the sitter for Veronese’s portrait was but it will almost certainly be a female member of the Venetian aristocracy. Whereas Titian’s woman looks out at us in a somewhat provocative manner, the female in the Veronese’s portrait has a somewhat restrained look as she averts her eyes from the observer. There is a look of sadness in her expression as she stares into the distance. She seems lost in thought and somewhat troubled. She does not seem to be at ease and maybe was a reluctant model, who has had to acquiesce to her husband’s demand that she should have her portrait painted. Her status as a married woman is confirmed by the ring she wears on her left hand. She looks tired and there are lines around her eyes. There is a vulnerability about this woman which makes us question whether wealth has given her all that she desired. My final offerings are a pair of paintings by Veronese based on the dream of Saint Helena. One is housed at the National Gallery, London whist the other can be found in the Pinacoteca Vaticana, in Rome. The Dream of Saint Helena in the National Gallery was completed around 1570 and the Vatican painting of the same name was thought to have been completed by the artist five or six years later. The story behind the depiction tells of the Flavia Julia Helena, the Empress mother of Constantine the Great, receiving a visitation from an angel in her dream. The angel tells Helena that she should leave home, travel to the Holy Land in search of the relic of the true cross on which Christ was crucified. She set off for Palestine in 326AD on a part spiritual part diplomatic visit on behalf of her son Constantine and, after a two year search, found the cross. Since then, the imagery of the saint has always been associated with the relics of the cross. We can see by looking at the two works, only the one which is housed in London’s National Gallery has a depiction of two angels and so this could well be the work which Ridolphi was talking about. 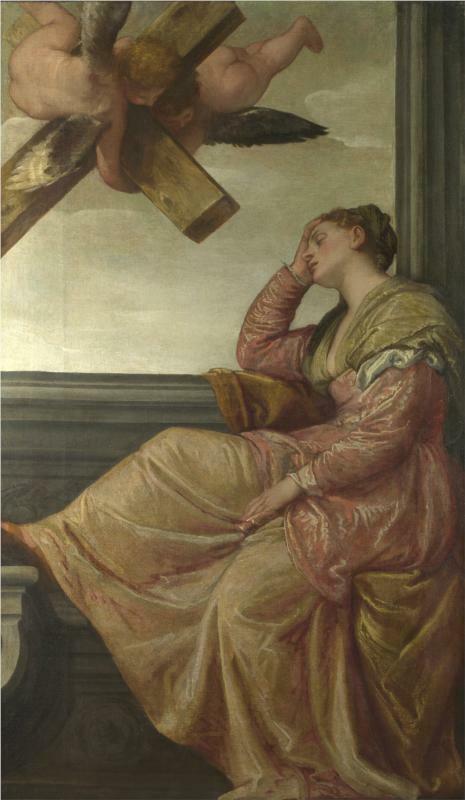 Veronese, with great skill, depicts the dream of Saint Helena in the National Gallery painting by separating the work into two distinct areas. 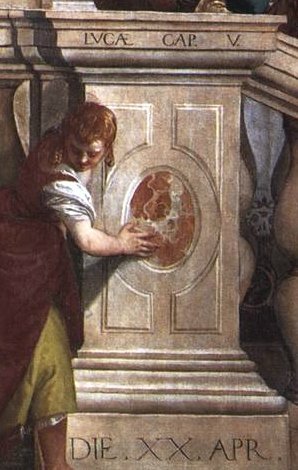 The foreground represents the “here and now” and in it we see Saint Helena, eyes closed, asleep on a window seat with her head supported by her right hand and her right elbow resting on the window sill. The view through the square window is the space which depicts the dream scene and in her dreams she sees two angels struggling to hold a very heavy and substantial wooden cross. It is a somewhat bare composition but the inclusion of Saint Helena lends an elegance to the depiction. The colours Veronese has used for Helena’s gown are fairly subdued, albeit the cool greens on one hand and the warm golds, rich pinks and oranges, on the other, harmonise perfectly. 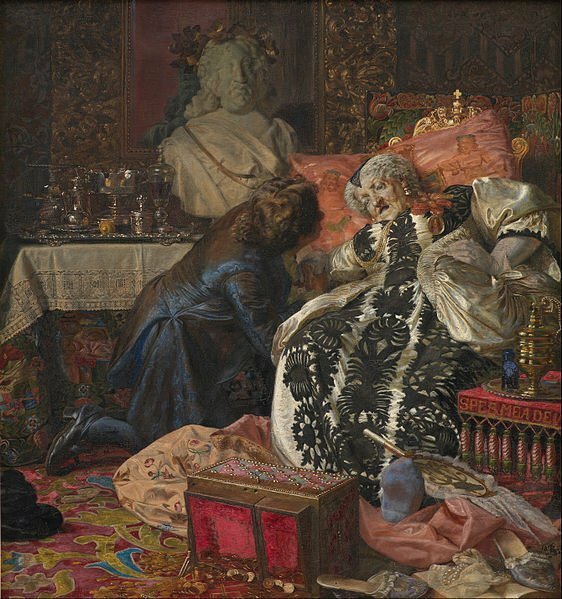 Look how Veronese has cleverly highlighted the garment with flecks and whirls of white and examine carefully the way he has skilfully depicted the folds of Helena’s gown. 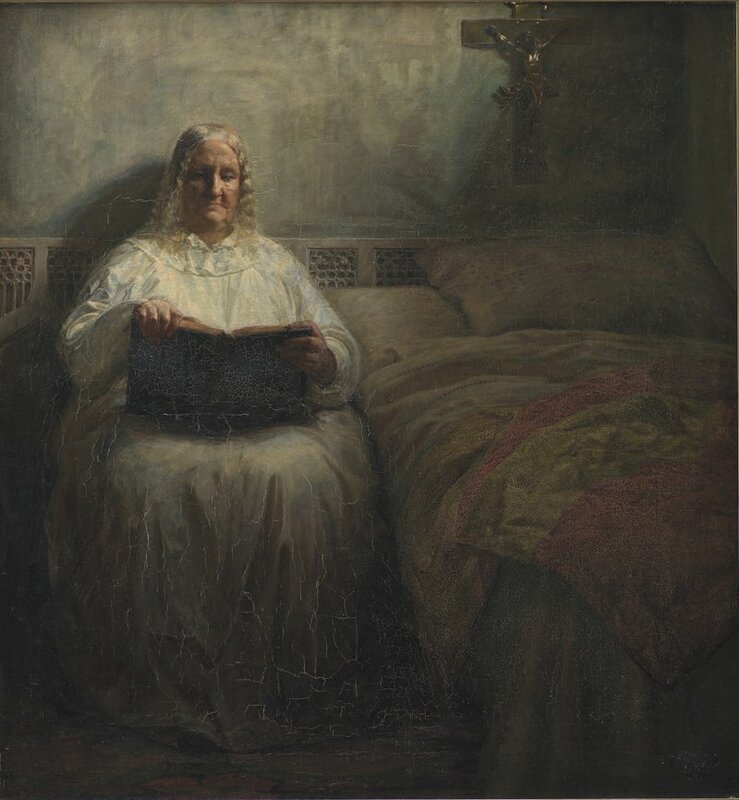 In the Vatican’s Dream of Saint Helena we see Helena seated in a luxurious palace location. This work is completely different to the starkness and sparseness of the London version. In this painting the background consists of a decorated wall covering. To the left there is a fluted column and behind the chair is a bronze statue. 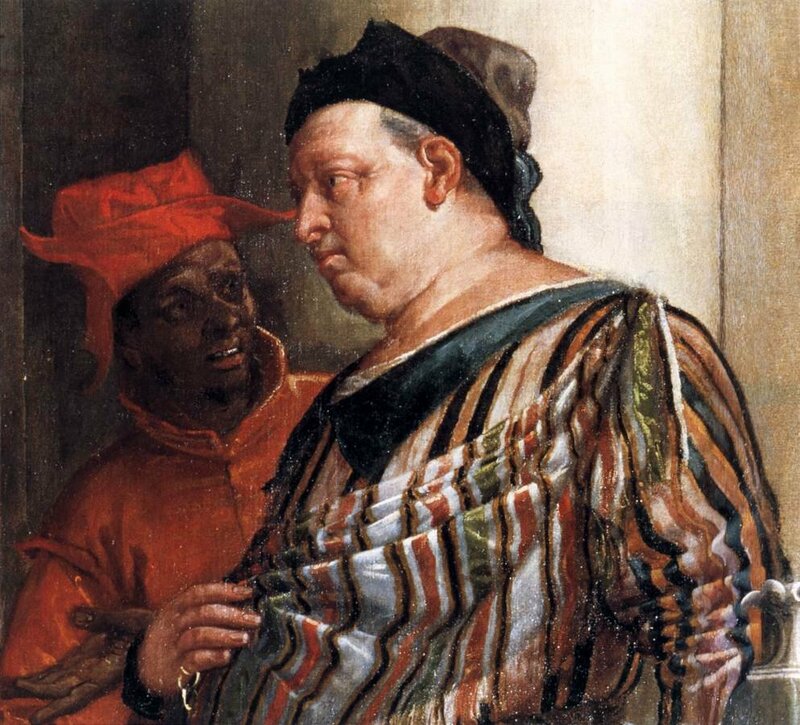 Veronese’s depiction of her in this painting is one of an opulently dressed empress. 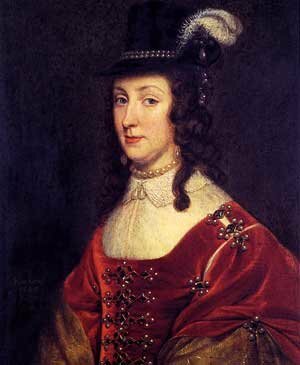 She wears a glorious brocade dress with a red mantle. A jewelled crown sits atop her head. She is seated asleep in a chair, and once again, as in the London painting, her head is supported by her hand. In the right foreground we see the rear view of an angel who appears to be walking into the picture dragging along a large wooden cross. 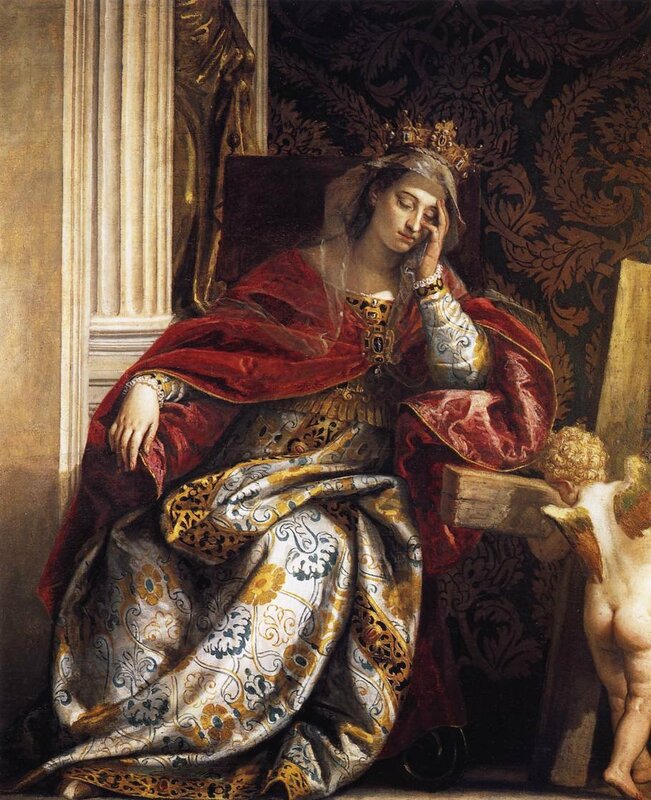 This is the vision Saint Helena is dreaming about and through Veronese’s two depictions we are privy to that dream. 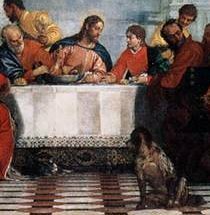 In my next blog I am staying with Veronese and looking at a painting which was 42 ft (1280 cms) wide was far too large to be transported to London. It was a painting which combined a secular scene with a religious story and by so doing fell afoul of the Inquisition. His inquisitors were not amused!